Qing Yi Miniatures from China produces high quality resin figures and lately started to a new series of German Soldiers in action poses. QY35001 depicts a World War II German soldier throwing a hand grenade. The kit comes in a good quality metal box labeled with a photo of the figure painted by Han Dong. Inside the box, parts are inserted in a plastic zip-lock bag and well protected between two slabs of polyfoam. Casting quality is absolutely top-notch. No mistakes, air bubbles, excess resin, casting blocks or seamlines on the figure. Parts are very clean and ready to paint as assembled without any need of a cleanwork. Posed to throw a grenade, figure is sculpted by Qing Yi as a full body figure with field gear cast on it in crisp details. Only hands with weapons and shovel are given as seperate parts. Facial details on nose, eyeholes, ears and open mouth with upper teeth are well defined. He has a Steel Helmet M42 Stahlhem on his head. Helmet details like liner rivets, vent holes and flared out edges are well represented. Chinstrap with buckle is also cast on the face. He wears standard Germany Army M36 field uniform of Tunic Feldbluse in grey-green color with five front buttons, four pleated pockets-two breast and two waist -all with flap covers and secured with metal buttons and Trousers Feldhose in stone gray color. Wrinkles and cloth folds, pockets, buttons, shoulder boards. collar and collar insignia Litzen of the uniform, black leather belt Koppel and Y-Strap Koppeltragegestell, buttonholes and buckles of Y-strap, gas mask case strap crossed on his chest are well defined. Typical German field gear is cast on the figure in crisp details. He carries triple leather ammo pouches Patronentaschen on both sides of his belt and a Model 24 Stick Grenade Stielhandgranate known as potato masher is inserted under belt buckle. On the back side, he has Breadbag Brotbeutel on the right hip. Over the bread bag; kidney shaped cooking pot/Mess tin Kochgeschirr and Field Bottle Feldflasche are attached to his belt. In the middle, there is a rolled Camouflaged Shelter Quarter Zeltbahn M31. On the left side, he carries GAsmask case Tragbusche fur Gasmaske and Bayonet Seitengewehr SG 84/98 for Kar98 rifle. Details of all field gear parts are very well represented. As for the footgear; he wears Ankle Boots Schnürschuhe. Over his boots, he has gaiters Gamaschen. Arms are also sculpted with the body and show nice cloth folds. Right arm is posed to throw a grenade and left arm holds a rifle. In my opinion, if the sleeves were hollowed for the fit of hands, it would be great for a very realistic look. Right hand holds a Stick grenade made of a metal explosive head and a wooden handle. Left hand has the rifle. 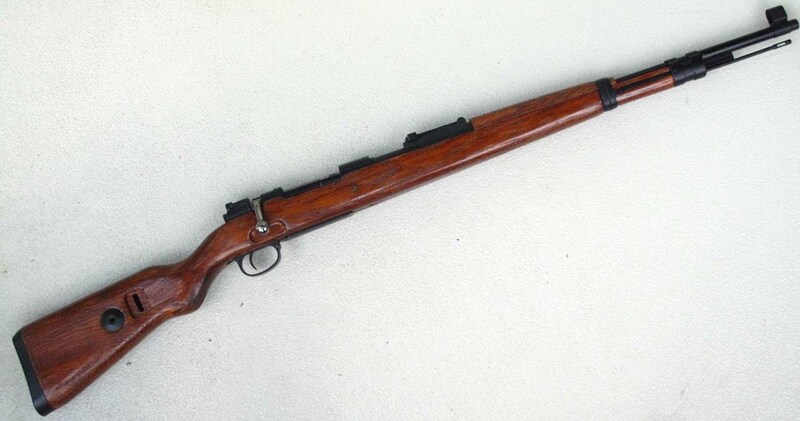 It is the primary rifle for all German soldiers of World War Two. Mauser Kar98K. Folding shovel Klappspaten is given as a seperate part to be assembled on the back side under the rolled Zeltbahn. This is an easy to assemble figure with only four parts, sculpted and cast in excellent details. A very unique German soldier for modelers who like to paint in action posed figures. Highs: Nice action pose, ease on assembly with less parts,very nice sculpt in crisp details and excellent cast. Served in a good looking metal box. Lows: No serious lows to mention but hollowed sleeves for fit of hands would be great. Verdict: Great action posed figure for World War II battle scenes. Our Thanks to Qing Yi Miniatures! Seems like a nicely sculpted figurine that should prove useful to those interested in an action dio.